This is my first painting of Firefighter Rachel Smith, the hero of my new comic Persons Reported. 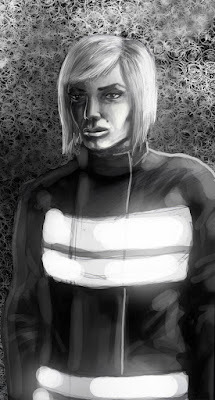 I have done lots of skethcbook work designing her, and am less than satisfied with this painting. I need to vary the brushstrokes of her hair to make it look more real and natural, and her face is a little swollen and overworked. Still, if you got everything right the first time round you'd lose all the satisfaction of improving. 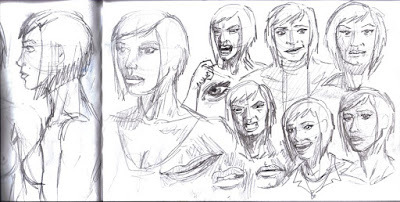 A sketchbook page of Smith, trying to show differnt expressions and still keeping her likeness. Firefighter Rachel Smith on the left, some pissed floozy sketched out of the newspaper on the right. 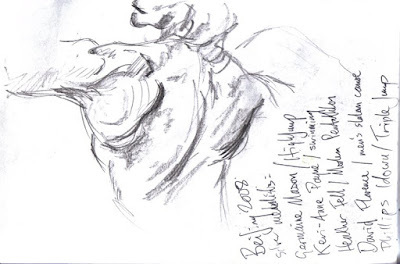 A Bridgeman study from lunchtime at work. Some anatomy studies from www.characterdesigns.com/ Bridgeman is good for showing you how lumps wedge together, am still trying to figure out how curves fit together. 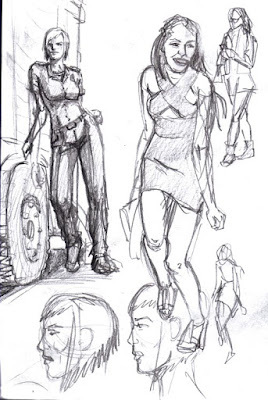 More figures sketched out of the newspaper.